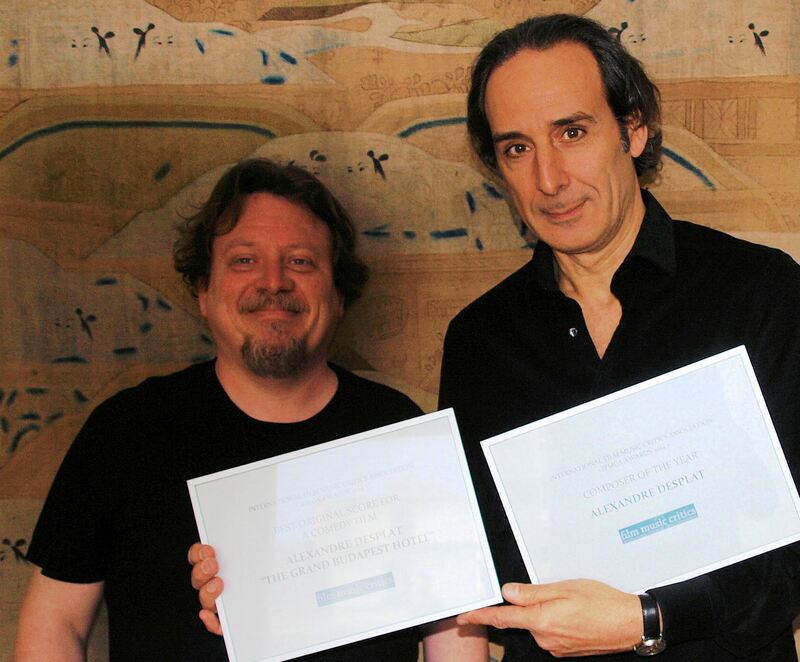 Composer Alexandre Desplat has been presented with the International Film Music Critics Association Awards for Composer of the Year and Best Original Score for a Comedy film by IFMCA member Olivier Desbrosses. 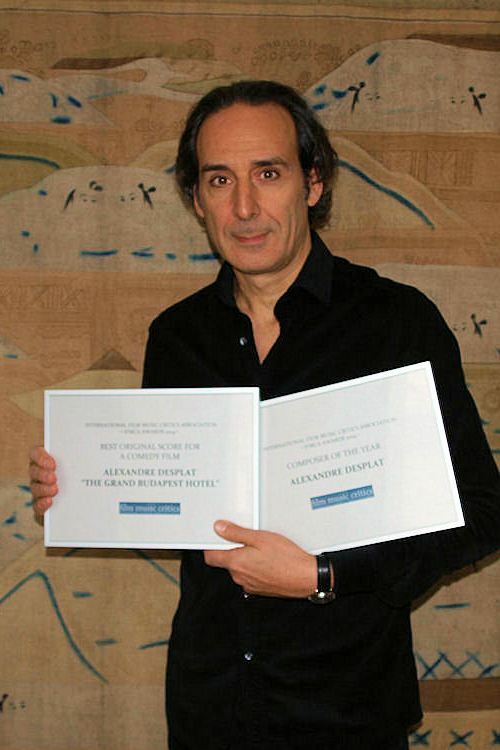 Desplat received the Comedy Award, for his Oscar-winning score for the stylish period comedy The Grand Budapest Hotel; his other scores in 2014 included the blockbuster monster movie Godzilla, the critically acclaimed biopic of British code breaker Alan Turing The Imitation Game, and the George Clooney-directed WWII drama The Monuments Men, all of which were nominated in their respective genre categories. These are Desplat’s 10th and 11th IFMCA Awards, from a total of 41 nominations. He was named Composer of the Year in 2006, 2007 and 2010; won Best Original Score for a Fantasy/Science Fiction Film for The Golden Compass in 2007; won Film Score of the Year and Best Original Score for a Drama Film for The Curious Case of Benjamin Button in 2008; won Best Original Score for a Drama Film for The King’s Speech and Best Original Score for an Action/Adventure/Thriller Film for The Ghost Writer in 2010, and won Best Original Score for an Animated Feature Film for Rise of Guardians in 2010. The other nominees for Composer of the Year were Marco Beltrami, James Newton Howard, John Powell and Hans Zimmer, while the other nominees in the comedy category were Roque Baños for Cantinflas, Matthew Llewellyn for Wishin’ and Hopin’, Joel McNeely for A Million Ways to Die in the West, and Alan Silvestri for Night at the Museum: Secret of the Tomb. The Grand Budapest Hotel is a caper comedy directed by Wes Anderson, set 100 years ago in the fictional country of Zubrowka – a place Anderson describes as “part Czech, part Hungarian, part Polish, part Russian, part German, and a little bit 1930’s movie-studio in Culver City”. It stars Ralph Fiennes as Gustave H, a legendary concierge at the famous European hotel of the title, and Tony Revolori as Zero Moustafa, the lobby boy who becomes his most trusted friend. Following the death of a wealthy elderly female guest Gustave and Zero become embroiled in a plot concerning the theft and recovery of a priceless Renaissance painting and the battle for an enormous family fortune. 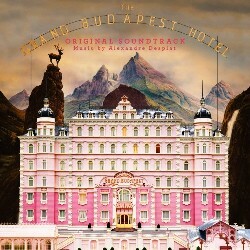 Desplat’s score is a quirky, unique, rhythmic romp through the musical traditions of Central Europe, blending zithers, Hungarian cimbaloms, Gregorian chants, Alpen horns, whistlers, Russian balalaikas, organs, bells and even yodelers with his symphony orchestra. IFMCA member Jon Broxton called The Grand Budapest Hotel “the best Anderson/Desplat score to date,” IFMCA member James Southall described the score as being “full of comic charm, it breezes over the listener like a welcome light wisp on a warm summer’s day”, while IFMCA member Christian Clemmensen called the score “a hilariously irreverent treatment of European musical stereotypes”. Desplat was born in Paris, France, in August 1961, the son of a French father and a Greek mother who met while they were both studying in the United States. Desplat studied privately as a child, becoming proficient in piano, trumpet and flute performance, and later studied composition with Claude Ballif and Iannis Xenakis in France, and with master orchestrator Jack Hayes in the United States. Always intending to work in cinema, Desplat scored his first film, Ki Lo Sa, in 1985 at the age of 24, and over the course of the next 15 years scored numerous films in his native France, before scoring his first major Hollywood film in 2003, the Oscar-nominated period drama The Girl With the Pearl Earring. As soon as Hollywood discovered his beautiful, theme-filled, neo-classical style, Desplat went from strength to strength: in the ensuing decade Desplat has scored box-office successes such as The Curious Case of Benjamin Button (2008), New Moon (2009), The King’s Speech (2010), Argo (2012), and Harry Potter and the Deathly Hallows (2011/12), as well as critically acclaimed works such as The Queen (2006), Fantastic Mr. Fox (2009), and Philomena (2013), all of which received Academy Award nominations. 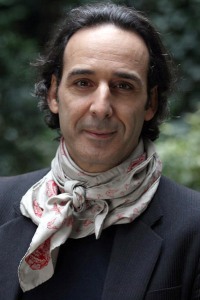 Desplat has received eight Oscar nominations (winning for The Grand Budapest Hotel in 2014), seven Golden Globe nominations (winning for The Painted Veil in 2006), seven BAFTA nominations (winning for The King’s Speech and The Grand Budapest Hotel), five Grammy Award nominations, and eight César nominations in his native country, winning for De Battre Mon Coeur s’est Arrêté in 2005, The Ghost Writer in 2010 and De Rouille et d’Os in 2012. In addition to his film music career, Desplat has composed individual songs that have been sung in films by artists such as Akhenaton, Kate Beckinsale, Charlotte Gainsbourg, Valérie Lemercier, Miosotis, and Catherine Ringer. He has written music for the theatre, including pieces performed at the Comédie Française, has conducted performances of his music played by the London Symphony Orchestra, the Royal Philharmonic Orchestra, and the Munich Symphony Orchestra, and has given Master Classes at La Sorbonne in Paris and the Royal College of Music in London. In June 2013, Desplat’s Concerto for Flute & Orchestra premiered in France with flautist Jean Ferrandis and the Orchestre Nationale des Pays de la Loire conducted by John Axelrod. His Trois Etudes for Piano originally written for pianist Lang Lang had its U.S. premiere in October 2013 played by pianist Gloria Cheng.